Middle East Perspectives by Rick Francona: IAEA access to Iranian military sites - nuclear deal breaker? IAEA access to Iranian military sites - nuclear deal breaker? 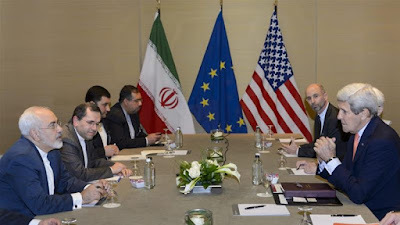 The above photograph was taken in 2015 during the final negotiations that resulted in the Joint Comprehensive Plan of Action (JCPOA), or more commonly, the "Iranian nuclear deal." I hesitate to call these talks negotiations - the American discussant was the ineffectual Secretary of State John Kerry who agreed to virtually everything his Iranian counterpart wanted. The key issue during this particular session was United Nations (UN) inspectors' ability to interview Iranian scientists and to inspect military facilities suspected of being involved in Iran's nuclear research and development program. At that time, senior Iranian negotiator Abbas Araghchi stated flatly, "Interviews with scientists are completely out of the question, and so is the inspection of military sites." In response, the director of the UN's International Atomic Energy Agency (IAEA), Yukiya Amano, reiterated the requirement that any deal with Iran include the authority to inspect any sites suspected of being a venue for nuclear-related activity, including military sites. In the end, the distinct wording of the signed JCPOA does not differentiate between military and non-military sites. That said, it is impossible to know if there was a secret understanding between the Obama Administration and the Iranian government to not demand inspections of Iranian military sites, given the previous Administration's overarching desire to reach an agreement, any agreement, with the Iranians. If that was indeed the case, the Trump Administration has demonstrated that its stance toward what it calls "the worst deal" will be much stricter and less tolerant of Iranian deceptive tactics. The issue of access to Iranian military sites is not yet resolved. A full two years later, IAEA Director Amano is still trading words with Iranian officials over access to these sites. Last week, an Iranian government spokesman said that any chance Iran would allow inspections of any of its military facilities was "a dream." Director Amano rejected Iran's claim that its military sites were off-limits to inspection, declaring that military sites could be considered "relevant locations" if the IAEA believes there are nuclear activities at the sites. He again made the point that in the agreement signed by Iran, the IAEA "has access to (all) locations without making distinctions between military and civilian locations." Iran's stance is not surprising. During the negotiations between Iran on one side, and the five permanent members of the UN Security Council (UNSC) plus Germany (P5+1) and the European Union on the other, the primary negotiators were Secretary Kerry and his Iranian counterpart Javad Zarif. To ensure that the Obama Administration was able to reach an agreement with Iran, Secretary Kerry acceded to almost every Iranian demand, including a word change in an existing UNSC resolution on Iranian missile tests, from "shall not" develop ballistic missiles to "is called upon not to" develop. * Zarif and the Iranians grew so used to having their own way during the Obama Administration, they are likely surprised that they are not being coddled by the Trump Administration as well. The fact that Iran is so sensitive about access to these military sites only arouses more suspicion. If I was part of the IAEA monitoring effort, it is probably the first place I would want to inspect. Given Iran's belief that these sites are exempt from inspection, it makes sense that any undeclared facilities, materials or equipment would be secreted at these locations. As an example of Iran's sensitivity, there was one inspection conducted at Parchin, a military site where it was believed some nuclear activity had taken place. Normally, IAEA inspectors take air and soil samples, as well as swabbing equipment at suspect sites. In this case, the IAEA allowed Iranian personnel to take the samples - not exactly instilling confidence in the integrity of the verification protocol. Per the Iran Nuclear Agreement Review Act of 2015, the President must certify that Iran is in compliance with the JCPOA every 90 days - the next certification is due in mid-September. For its part, the IAEA last week declared that it had noted no violations by Iran in its latest quarterly Iran monitoring report, although the agency was still searching for "undeclared nuclear material and activities." Director Amano, here's a hint: look at the military sites. If there are "undeclared nuclear material and activities," - and knowing the Iranians, I believe there are - that's where it will be found. If the IAEA does not inspect suspect Iranian military sites, how can they - or for that matter the President - certify that Iran is in compliance with the JCPOA? Well, technically, the IAEA is not stating that Iran is in compliance. What they said is that they "had noted no violations...."
Of course, if you don't look, you can't "note." * For more on this fiasco, see my earlier article: Iran's ballistic missile program - more fallout from the "Kerry Collapse"